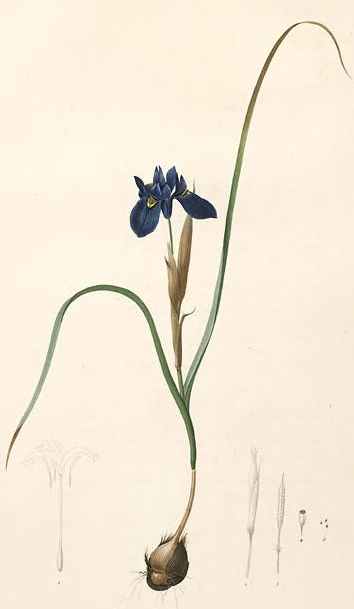 Moraea sisyrinchium (L.) Ker Gawl., Ann. Bot. (König & Sims) 1: 241 (1804). Let me begin by calling your attention to a little bulbous Iris which is perhaps the most widespread, geographically speaking, of the whole genus, and at the same time probably one of the oldest Irises in existence, retaining the archaic features of the stock from which many other Irises have descended. This is Iris Sisyrinchium (figs. 1 and 2), which may be traced from Spain, Portugal, and Morocco on the extreme west of Europe, through Algiers, Sicily, Corsica, South Italy, Greece, Egypt, Palestine, Asia Minor, Persia, and Beloochistan to Afghanistan and the Punjaub in the east. The bulb, small and globose that is to say, a flattened sphere may be readily recognized by its shaggy coats, several of which may be peeled off from an old bulb. Hence the name; for the Greek word sisyra (fftarvpa) means a shaggy goat skin. From between two very narrow channeled curving leaves springs a slender stem, half a foot or a foot, or even more in height; this bears at its summit, and sometimes on laterals, a tuft of small, purple, but variously marked, often fragrant flowers. Each flower is very fugitive; it does not last even a day. Opening in the late forenoon, it closes and withers in the afternoon, so that the owner who is away all day never sees it; but, to atone for this, many blooms open in succession. It varies much in stature, and in the colour and marking of the flowers. One of the most distinct varieties is the Iris maricoides of Regel, which I feel unable to sever from the rest as a true species. Another is the I. monophylla of Boissier and Heldreich, which has one leaf only, frequently one flower only, and a stem a few inches high. Considering, however, the wide geographical distribution of the species, it is to be wondered that it does not vary more. In one point of intimate structure namely, the coalescence of the filaments of the stamens in their lower parts with each other and with the styles it shows its affinity to some of the South African Irids, for instance, to the genus Moraea; and, indeed, by some authors the plant is spoken of as a Moraea, and not as an Iris. But I will not dwell on this, except to say that the amount of coalescence is variable. As a rule, this Iris does not do well in this country. In all its natural habitats it is sent to rest after flowering, being dried and baked by the heat of a dry, hot, rainless summer; this it does not naturally meet with in our land. And, though it is a pretty little thing, it hardly repays the efforts necessary to give it artificially such a summer. Whenever I have been able to get information as to the soil in which it lives at home, that soil has been, in nearly all cases, not " peaty sand," but a stiff clay, baked to a hard brick in summer. And though I cannot pretend to have had much success in cultivating it, it has seemed to me happiest when grown in the stiffest soil at my command. Probably in most places in this country the best plan would be to take the bulbs up after flowering, and replant in autumn. In any case it needs the hottest, sunniest spot. * Iris sisyrinchium L., Sp. Pl. : 40 (1753). Iris collina Salisb., Prodr. Stirp. Chap. Allerton: 45 (1796), nom. superfl. Diaphane edulis Salisb., Trans. Hort. Soc. London 1: 304 (1812), nom. superfl. Gynandriris sisyrinchium (L.) Parl., Nuov. Gen. Sp. Monocot. : 52 (1854). Xiphion sisyrinchium (L.) Baker, J. Bot. 9: 42 (1871). Helixyra sisyrinchium (L.) N.E.Br., Trans. Roy. Soc. South Africa 17: 349 (1929). Iris fugax Ten., Fl. Napol. 1: 15 (1811), nom. illeg. Iris syrtica Viv., Fl. Libyc. Spec. : 3 (1824). Iris sisyrinchium var. major Cambess., Mém. Mus. Hist. Nat. 14: 314 (1827). Iris sisyrinchium var. minor Cambess., Mém. Mus. Hist. Nat. 14: 314 (1827), not validly publ. Iris aegyptia Delile in L.Laborde, Voy. Arabie Pétrée: 82 (1830). Moraea tenoreana Sweet, Brit. Fl. Gard. 5: t. 110 (1831). Iris involuta Garzia, Effem. Sci. Lett. Sicilia 1834: 286 (1834). Iris zelantea Parl., Nuov. Gen. Sp. Monocot. : 53 (1854). Sisyrinchium majus R.M.Redhead, J. Linn. Soc., Bot. 9: 209 (1866). Iris samaritanii Heldr., Atti Congr. Int. Bot. Firenze 1874: 234 (1876). Evansia syrtica (Viv.) Klatt, Abh. Naturf. Ges. Halle 15: 373 (1882). Iris maricoides Regel, Trudy Imp. S.-Peterburgsk. Bot. Sada 8: 676 (1884). Moraea sicula Tod., Index Seminum (PAL, Panormitani) 1887: 37 (1887). Iris maculata Tod., Hort. Bot. Panorm. 2: 43 (1890), contrary to Art. 36.1c (Melbourne Code, 2012). Iris sisyrinchium subsp. fugax K.Richt., Pl. Eur. 1: 259 (1890). Gynandriris littorea Jord. in C.T.A.Jordan & J.P.Fourreau, Icon. Fl. Eur. 2: 27 (1903). Gynandriris numidica Jord. in C.T.A.Jordan & J.P.Fourreau, Icon. Fl. Eur. 2: 27 (1903). Iris sisyrinchium var. maricoides (Regel) Lynch, Book of the Iris: 189 (1904). Iris sisyrinchium var. maculata Fiori in A.Fiori & al., Fl. Italia 4(App. ): 52 (1907). Iris sisyrinchium var. syrtica (Viv.) E.A.Durand & Barratte, Fl. Libyc. Prodr. : 223 (1910). Iris libyca Mattei, Boll. Stud. Inform. Reale Giardino Colon. 3: 93 (1916). Iris sisyrinchium var. purpurea Braun-Blanq. & Maire, Mém. Soc. Sci. Nat. Maroc 8: 176 (1924). Iris sisyrinchium var. marmarica Pamp., Arch. Bot. (Forlì) 12: 25 (1936). Gynandriris maricoides (Regel) Nevski, Trudy Bot. Inst. Akad. Nauk S.S.S.R., Ser. 1, Fl. Sist. Vyssh. Rast. 4: 217 (1937). Iris sisyrinchium f. alba Gattef. & Weiller, Bull. Soc. Hist. Nat. Afrique N. 28: 542 (1938). Iris sisyrinchium f. rosea Gattef. & Weiller, Bull. Soc. Hist. Nat. Afrique N. 28: 542 (1938). Iris sisyrinchium f. violacea Gattef. & Weiller, Bull. Soc. Hist. Nat. Afrique N. 28: 542 (1938). Iris sisyrinchium f. caerulea Maire & Weiller, Fl. Afrique N. 6: 168 (1959 publ. 1960). Iris sisyrinchium f. purpureoviolacea Maire & Weiller, Fl. Afrique N. 6: 167 (1959 publ. 1960), not validly publ. Iris todaroana Cif. & Giacom. ex S.Pignatti, Giorn. Bot. Ital. 113: 367 (1979 publ. 1980).